It’s nice to sit in a Starbuck’s and relax with coffee as the Easter weekend draws to a close. I feel the exhaustion of having painted the past three days in a row. 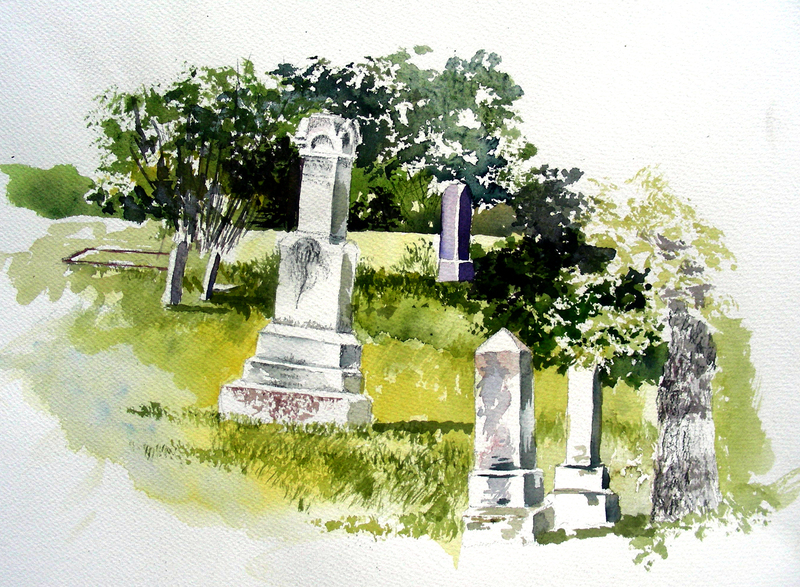 Yesterday was a plein air assault as I dashed to a secluded cemetery and pushed out a pair of watercolor sketches. The rest of the weekend was spent in my garage/studio, staring at this enormous (by my standards–22 x 28″) watercolor that I began several weeks ago and abruptly abandoned, not knowing how to handle the lawn. As stated in a prior blog, I photographed this Victorian home in January or February, while en route to the Brazos River in Possum Kingdom to fly fish for rainbow trout. The winter sun captured my fancy as I saw it playing off this stately hilltop mansion in Weatherford, just west of the courthouse. It so captivated me that I turned my Jeep around, and navigated the divided highway back around the estate’s property, found a storage facility where I could park my Jeep, and walked back to the property to photograph it with my digital camera. I really liked the long sprawling hill filling the foreground, thinking of how Edward Hopper created his gorgeous watercolors of these settings in New England. 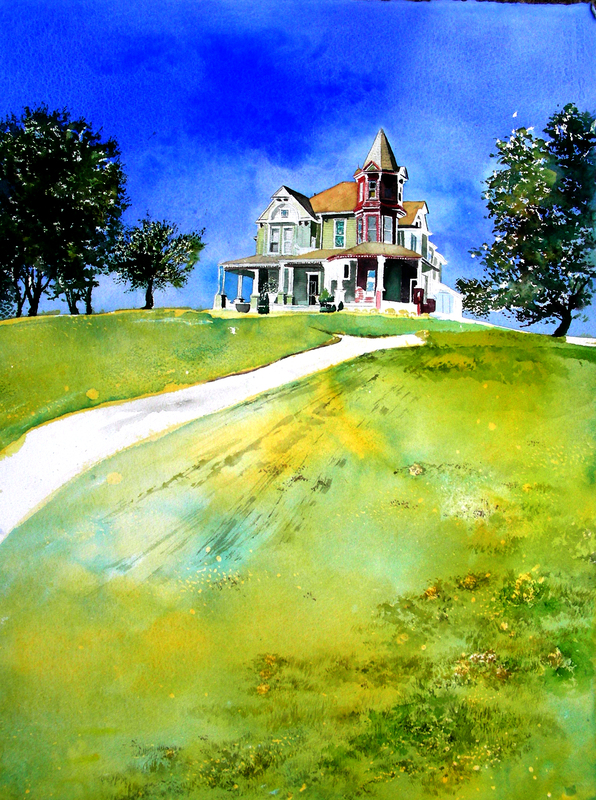 The house itself did not really create a problem for me–I just was not sure how to render all that winter grass, freshly mowed, but not yet emerald green, and not completely filled in either. On Friday I pulled the painting back out, and as I listened to Muddy Waters on the turntable, I began chipping away at the lawn, and resumed work on the house which was only about 2/3 completed. Any time the grass got too wet to paint, I just returned to work on the house, and when the house became sloppy and wet, I returned to the yard. I have to admit, I got lost in the house, and totally enjoyed the immersion! 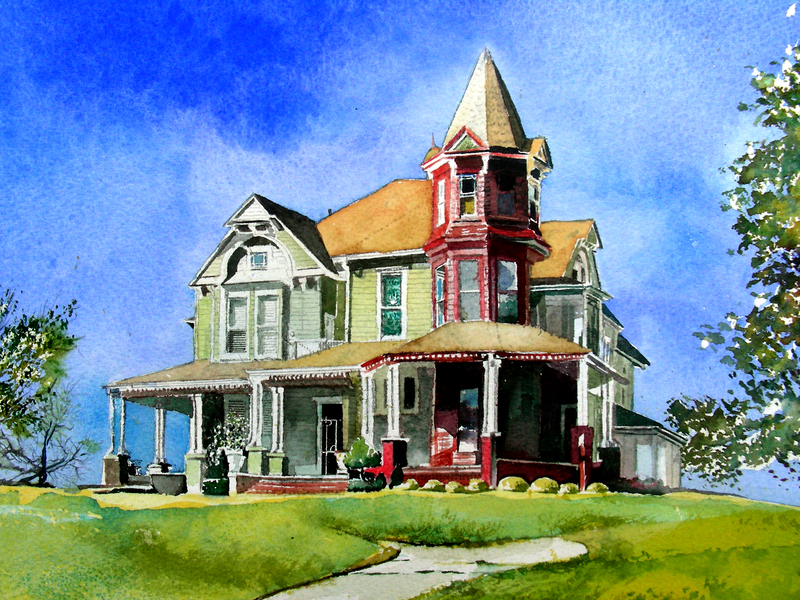 So many angles and details on a Victorian home, and all of them so attractive! The funny thing is, I thought I would be working on this for at least another week, when suddenly, I stepped back from my work, took one more look, and decided to sign it and quit. I think I did the right thing. I have lost so many watercolors by overworking them until they collapsed. I did not want to lose this one. To ensure that I would not “diddle” further with the painting, I packed it in the portfolio and delivered it to the Weiler House Fine Art Gallery, which fortunately for me was open today. (http://www.weilerhousefineart.com) The painting is now being framed and will stay at the Weiler. I’m pleased that another piece of work has been added to my one-man-show to open in September. 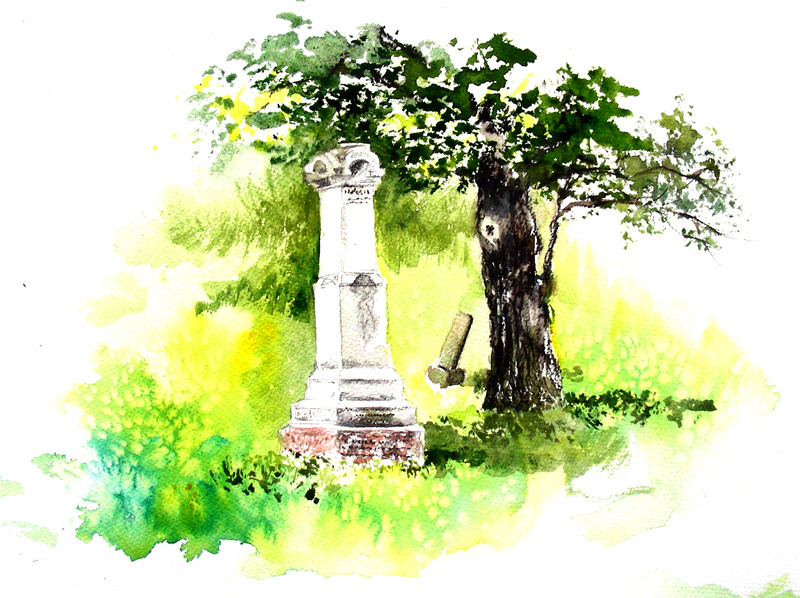 This is a super-quick watercolor sketch I attempted at the Cahill Cemetery, having finished the one posted under the heading “Elegy in a Country Churchyard.” The weather was too nice, the breeze too soothing, and the surroundings too quiet for me to leave at just that moment. I cannot express the depth of gratitude I feel to be alive, to have the time and space to pursue plein air watercolor experiments and to enjoy space and quiet like this afternoon. Working in pubic education can be taxing, to put it diplomatically. Weekends are sacred to me, and what is more appropriate than finding a churchyard in a quiet countryside to spend some quiet moments, the day before Easter. The Cahill Methodist Church is 2.7 miles east of I-35W on F. M. 917, south of Burleson, Texas. 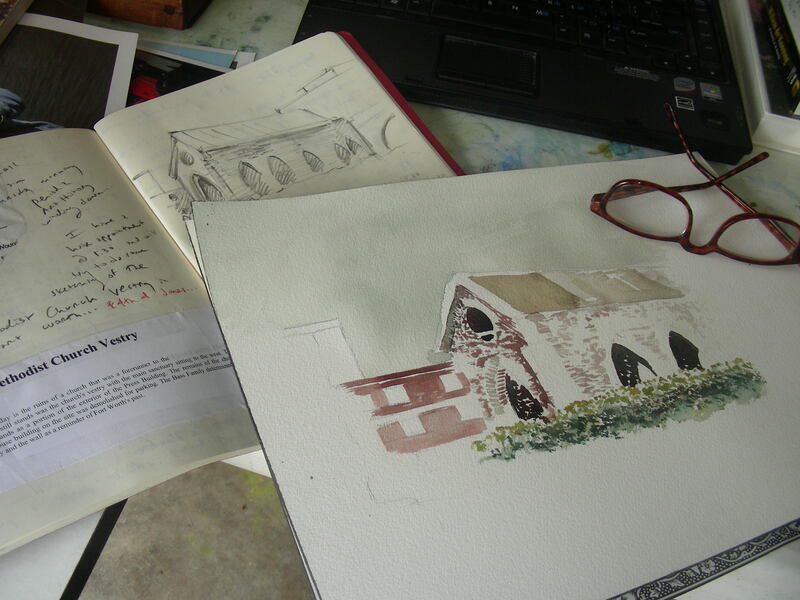 I have found this a splendid place for weekend retreats from the city, and this is my sixth watercolor sketch done on these premises. Finally I return to this large watercolor that I abandoned several weeks ago. I have been intimidated by the huge expanse of lawn, not knowing for sure how to render it. The grass was winter grass, not brown, but not very green either, and showing up in patches. Nevertheless the lawn was freshly mowed. So I was in a quandary–I’m comfortable rendering watercolors of dead, brown, tall weeds and of summer manicured lawns of verdant green. But I’ve never attempted this kind of grass patterns before, and certainly not on a full-size sheet of watercolor paper (about 22 x 28″). So far, I’m not unhappy with what is emerging. We’ll see what transpires tomorrow when I tackle it afresh. I’ve known from the start that if all else fails, I could take this painting to the paper cutter and have only the house and surrounding trees. 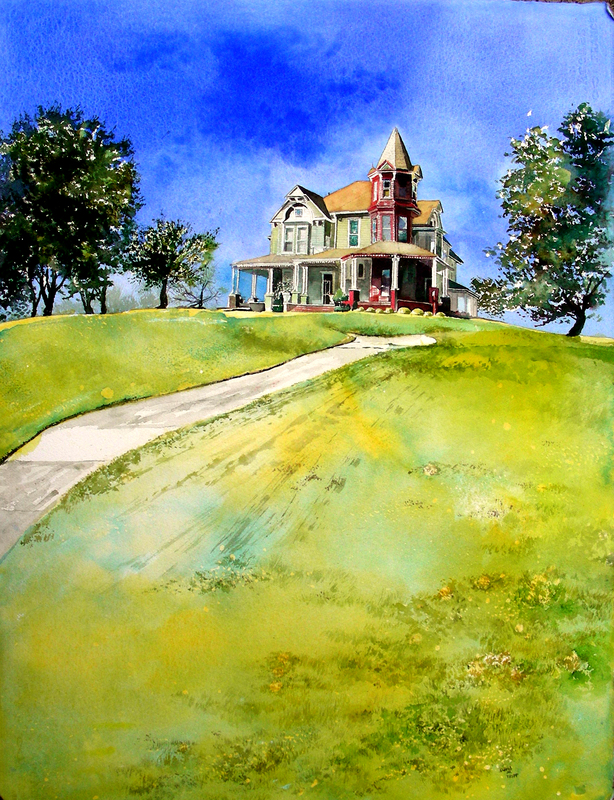 But I have always loved the Edward Hopper watercolor compositions where he has posted a Victorian home or a lighthouse high atop a verdant hill. I really wanted that kind of composition with this painting. The temperatures were somewhat mild, in the mid-80’s and the winds were tolerable today. I could not believe how quiet and isolated I was as I stood in this churchyard and created two paintings in the afternoon. The Cahill Church is located 2.7 miles east of I-35W on F.M. 917 (south of Burleson, Texas). My wife rides her horse on a local ranch in Burleson, and today I found it convenient to make the extra 10-minute drive to this quiet little place. Something tells me I will want to return to this place. This afternoon seemed to offer the perfect space for watercolor exploration. Today, Friday morning, April 22, 2011 begins a 3-day weekend for me. While in classes yesterday morning, I suddenly was seized with this notion to visit this relic from the edge of downtown Fort Worth, Texas. 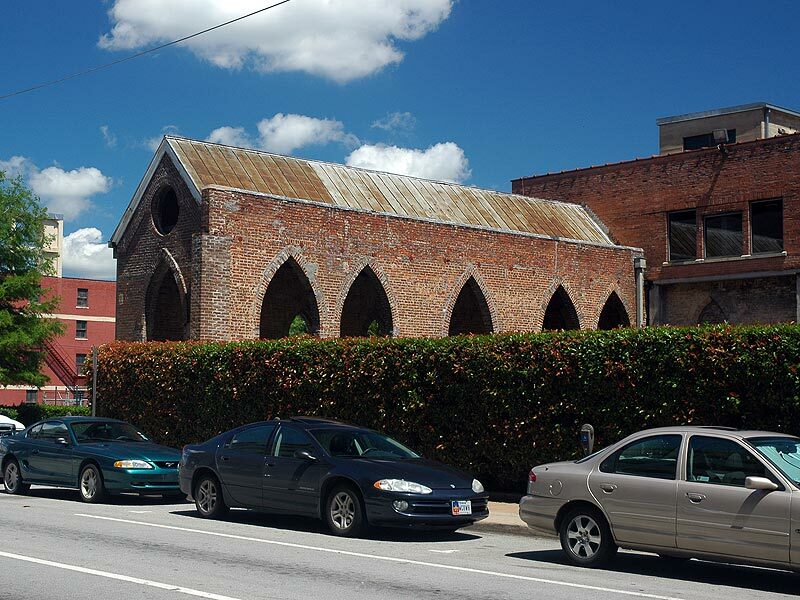 It is what remains of the 1887 Fourth Street Methodist Church (today First Methodist Church, in a different location). The ruins were discovered a few years back when demolition began of a storage facility, with no knowledge that the skeletal remains of this vestry were within the old structure. The Bass brothers decided not to destroy the relic. For the past two weeks (is this serendipitous?) I have been mulling over William Wordsworth’s “Lines. Composed a Few Miles above Tintern Abbey, on Revisiting the Banks of the Wye during a Tour. July 13, 1798.” I have also lingered over a watercolor by J. M. W. Turner, composed while the painter was quite young and visiting that same Medieval ruin of a church. The poem and the painting have been on my mind the past few weeks, again with all those Proustian notions–of memories, of loss and of presence. Other writers have expressed this better than I, but I know these heart-shuddering sentiments of standing in the midst of something left over from the past, with the wreckage of decomposition prevalent, and I simultaneously feel a profound loss and an exhilarating “presence.” This is what I feel when I look on this church ruin adjacent to a thriving Sundance Square in Fort Worth, Texas. At the close of the 19th century, worshipers, mourners, seekers–people of all persuasions–lingered on these grounds and worshiped within the sacred space. I tried to focus on those matters while the traffic of downtown Fort Worth whizzed past me. One memorable moment during this 30-minute sketching exercise was a courteous bicycle security guard working for the city stopping by and chatting with me for a few minutes. Her presence, and the knowledge that there were “many of them” about the town, made me feel safer to return here and sketch again. Indeed I shall. Thank you for reading. It is now Saturday, and I hope to get some quality work done in watercolor by the close of this day. So, what does the Beat writer William Burroughs have to do with a tree? I’m spending some time in the book Ports of Entry: William S. Burroughs and the Arts. I have always gotten a kick out of his “cut ups” and I myself used to pursue collage quite seriously. But during this past week or so (while the blog has unfortunately lay dormant) some disparate elements have been “composting” within my consciousness, and I’m now trying to find a way to bring them to the surface. 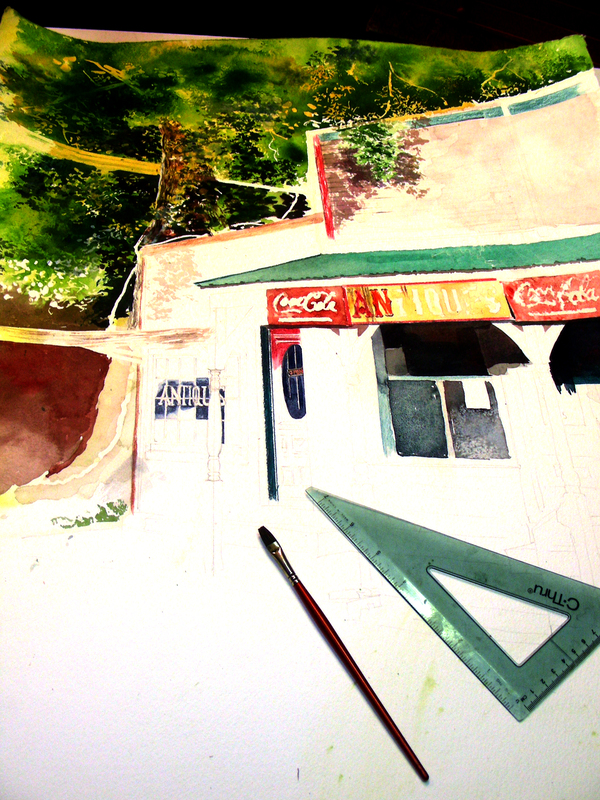 I don’t want to say I am facing dissatisfaction with my watercolor work. Rather, I am creating a rather unsatisfying body of work as I’m experimenting with new images and studying new techniques and approaches. 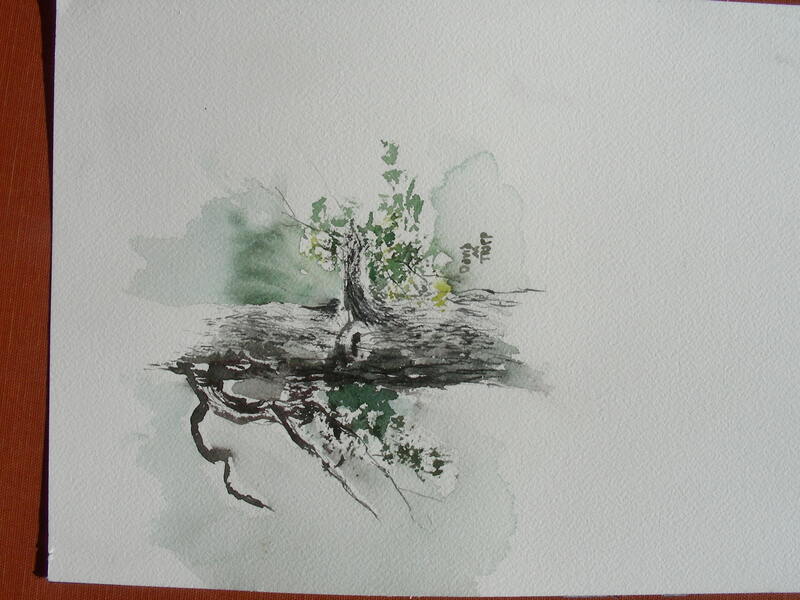 Currently I am trying to solve some “tree” problems–I have never, ever, been satisfied with my watercolor trees, though many have spoken very well of them. My actual foliage (to me) is nothing more than Jackson Pollock techniques that somehow translate into foliage. Right now, I’m staring at leaf clusters of various trees in parks and in neighborhoods as I drive daily, and have decided it is time to figure out how to capture their structure, or “essence” if I want to go in the direction of the “canons” of Xie He. I’m getting closer to what I want with the tree bark, though I must confess I spend hours gazing longingly at Andrew Wyeth dry brush studies. What a Gift he was! To return to my rambling discourse (perhaps I should edit this carefully before sending it up the flagpole), I’m comparing some of the remarks of William Burroughs in writing with statements I have pulled up from the Autobiography of William Carlos Williams and his ideas that launched Imagism in poetry, and also some real gems from The Collected Writings of Robert Motherwell. In all three of these brilliant minds, I see this idea of “abstracting” from daily life the elements that arrest our attention and rendering them artistically in some form or fashion. This is what I am trying to do with trees (and Victorian homes and simple framed buildings, etc.–it never ends!). I’m going to try again today to get some watercoloring done. I did manage that on Sunday and Monday, but the work was really God-awful bad to look at, so I kept it off the blog (I know, it goes against my principles of what blogging is all about, but really, the recent work is really bad!). I grew up listening to the adage that physicians’ children were the sickest, teachers’ children the dumbest, preachers’ children the meanest, mechanics’ cars the worst maintained, etc. 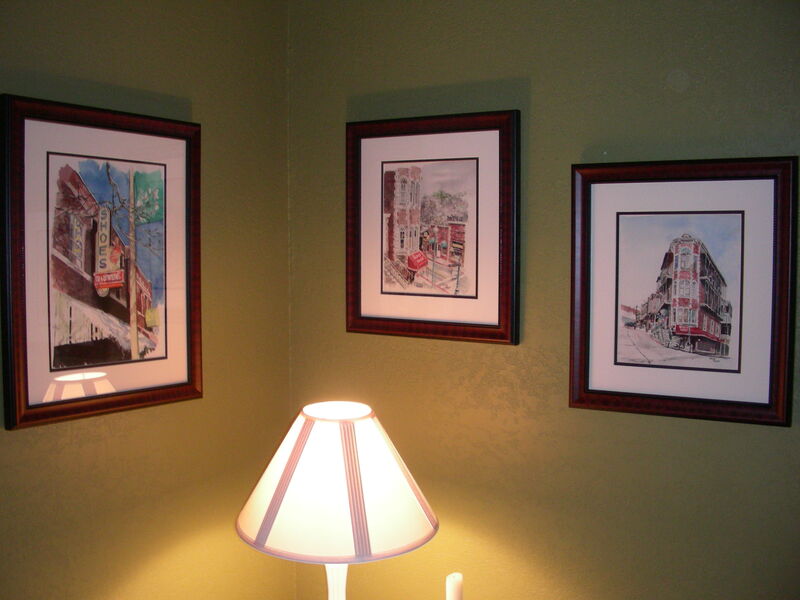 For year after year, I could not afford to custom frame my own watercolors, then once I could afford it, I started selling them more than hanging them. Finally I have been able to fill my own home with custom-framed work of mine, and am glad to be able to look at them. With my first one man show approaching this September, I need to frame sooner rather than later, so I don’t find myself scrambling for “presentation pieces” when show time arrives. These three I just picked up from the Weiler House Fine Art Gallery in Fort Worth, Texas–the gallery that will host my September show. I have already posted the images as I completed them in the studio recently, but wanted to show the presentation in my entry way as it now appears. 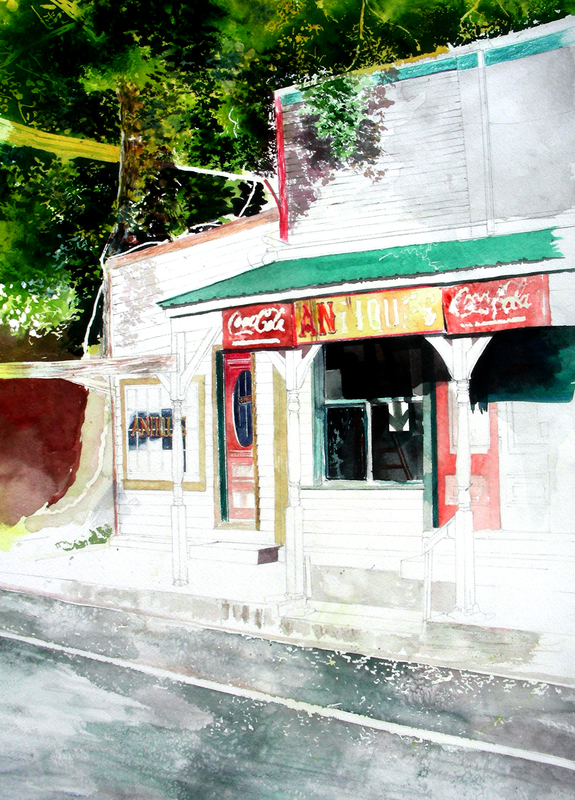 Yesterday afternoon I managed to begin my first plein air watercolor study in over a week. I have errands to run at the moment, but hopefully I will return to the work later this afternoon and post this evening. 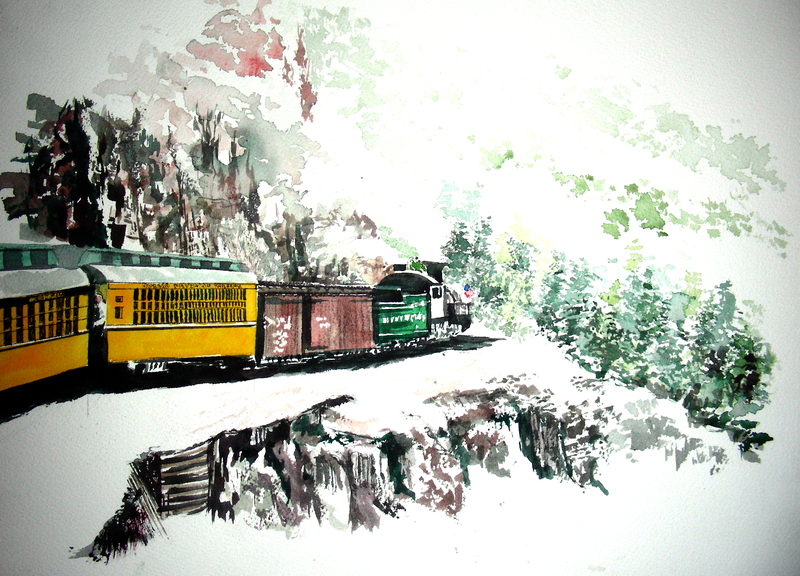 On the final day of Art in the Park in Kennedale, Texas, I began this quick watercolor sketch of one of my favorite subjects–the Durango-Silverton railroad in Colorado. The first time I rode this train, I was seated in the rear car and was able to photograph the front section of the train repeatedly. I have already done several watercolors of this subject, but never from this angle. I had very little time to paint this today, as (gratefully) the festival was extremely busy with patrons and prospective buyers. I enjoyed every conversation throughout the day, and even made special friends of a family from London, England and Aberdeen, Scotland, in the United States on a holiday. Well, school resumes tomorrow, I am absolutely “wiped out” from the 3-day weekend festival, I have high school all day and college all night, plus I need to make a delivery to one of the patrons who purchased art that was not available in the booth. Time for bed.